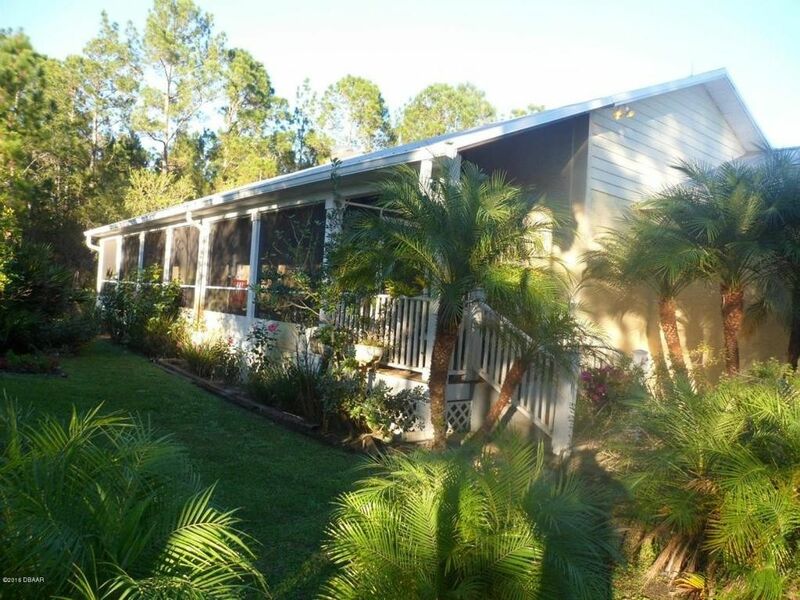 Stunning & immaculate home on 2.5 acres, so bring your horses, toys & your RV too! Private & secluded but close to everything & only 20 minutes to the beach! Custom built in 2007, this 3BR/2BA/2GAR CBS home with metal roof has an open floor plan great for entertaining & includes a detached 20x48.5 metal RV Garage/workshop. Top quality thru out, including granite counters & wood cabinets in the kitchen, both bathrooms & in the attractive wet bar in family room. Other features include cathedral ceilings, plantation shutters, skylights, alarm system and wood & tile floors throughout. Gourmet kitchen has cherry beaded wood cabinets, a huge pantry, SS appliances & an island w/granite counters that opens to the great room., Huge screened front porch surrounded by attractive palm trees & tropical landscaping welcomes you to this hand crafted home with rustic feel of old Florida! French doors open to private screened porches off the MBR & the Family room. Zoning allows horses & no flood insurance is required. A/C system just replaced May, 2017 & the septic was also serviced in May, 2017. See sellers disclosure for more details.